Those wishing to reduce the German economy, its potential for development, the value it creates or the number of people it employs to its most important common denominator have for years drawn on the following adage: ‘Germany is a car nation.’ And it is true and still true that Germany is a car nation. But, it is a saying that more than ever needs something decisive added to it – which is: ‘Germany is a car nation as well as a health nation.’ That is because, over the last 10 years, the health economy has grown significantly faster than the economy in general. The number of people in Germany who work in the health sector increased to more than seven million for the first time in 2016. The health industry’s industrial segment alone now provides jobs for a good 900,000 people and therefore 100,000 more than the automotive industry does (sources: BMWi/ GGR, VDA). Irrespective of any discussion about financing and the costs for modern healthcare provisions, the health sector is a stability factor and driver of growth not only in Germany but across the world. Europe and the USA are still the main export markets for medical-equipment companies, large numbers of which will be represented at the world’s No. 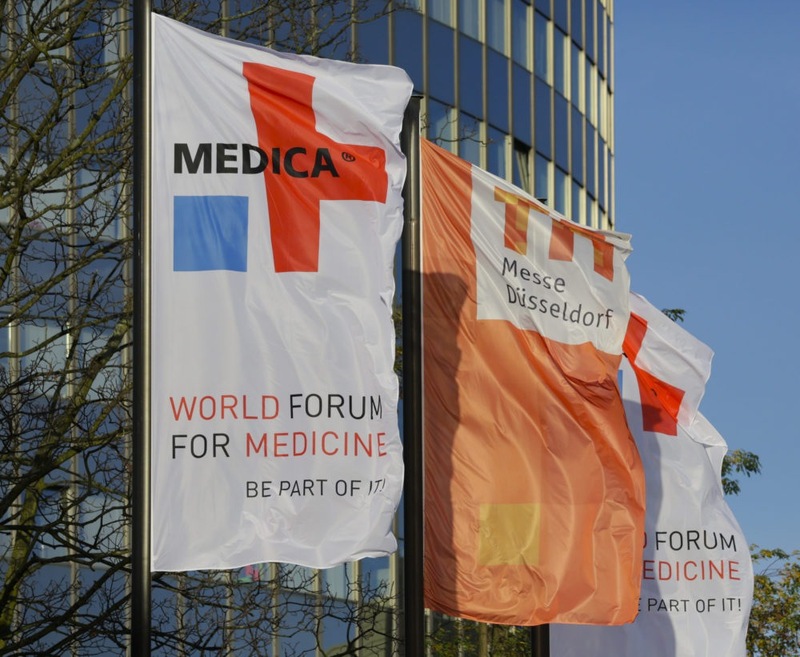 1 leading trade fair – MEDICA – which will be taking place in Düsseldorf from 13 to 16 November 2017. The registrations to date lead us to expect that more than 5,000 exhibitors from 68 countries will be taking part. Besides the ‘classic’ target markets of Europe, North America and Japan, suppliers are also increasingly focusing on emerging economies in spite of some uncertainties. That is because people’s willingness to spend on health is increasing with rising incomes in these markets. More and more prosperity-related diseases and greater life expectancies in these countries are additionally driving up demand for medical products and modern treatments. The large number of people who will be attending MEDICA from other countries, particularly from Asia, is indicative of these increasing needs. Of the 120,000 to 130,000 trade visitors that MEDICA has regularly welcomed over the past, a good 60% of these travelled to the event from countries other than Germany. The significantly increased popularity with visitors and exhibitors that the Messe Düsseldorf Group’s medical trade fairs are enjoying in opportunity-rich continental markets – for example, the MEDICAL FAIR INDIA and MEDICAL FAIR ASIA – also shows how attractive these markets for medical-equipment suppliers are and demonstrates that a great potential to do business exists there. This applies in particular to the highly innovation-oriented privately funded areas of inpatient and outpatient care. But, just like the automotive industry, the healthcare sector is also experiencing rapid change. Digitisation is affecting all aspects of supply and such buzzwords as ‘networking’ and ‘artificial intelligence’ are characterising the technical discussions and are already affecting production in particular. MEDICA 2017 will provide professionals with the opportunity of gaining insights into all the developments – during the presentations and talks at the MEDICA CONNECTED HEALTHCARE FORUM, during the MEDICA HEALTH IT FORUM and even with the help of the exhibitors’ new products as well as the exciting MEDICA APP COMPETITION. More and more health applications for smartphones, tablet PCs and ‘wearables’ – applications that are already enjoying increasing acceptance in the practical world – are going to be presented, for instance, within the appropriately relevant contexts. 45% of German smartphone owners are already using health apps and another 45% can see themselves using them. A further 60% of people in Germany approve of the concept of an electronic patient file that could be used to store their medical data centrally (Source: Bitkom/ Bayerische TelemedAllianz BTA). That is why one of the leading German health insurance providers has taken the initiative and commissioned the development of an electronic patient file for its more than 10 million clients. The plan is for customers to be able to access their health and treatment data on a central server with the help of a security code and an app or Internet browser. Standardised interfaces are to be implemented to enable the data to be exchanged between IT systems in doctors’ practices and clinics. Artificial intelligence is another challenge that the healthcare sector is facing. A robot that is able to automatically set up needles for infusions and biopsies was already presented to an amazed expert audience at MEDICA 2016. It is therefore not surprising that artificial intelligence is on the agenda for this year’s MEDICA HEALTH IT FORUM. Because what previously seemed like ‘science fiction’ is currently on the threshold of becoming reality in concrete and plausible applications. IBM’s ‘Watson’ cognitive assist system, for example, is already helping to diagnose rare diseases at the University Clinic of Marburg. It is doing so by analysing patient data and comparing it with huge quantities of information about successfully solved previous cases and searching for documented symptoms and the drugs administered accordingly. The analysis also takes digitised medical knowledge sourced from databases, publications and even Wikipedia into account. It is then able to generate a list of probable diagnoses. Developments in the field of medical imaging appear just as revolutionary. The first applications to use artificial intelligence for the automated detection of possible tumours on the basis of digitally generated image data from CRT or MRT systems are about to be launched on the market. The above examples demonstrate the dynamic that the healthcare sector is currently experiencing. For the ‘market players’ in the field of medical technology this means: Only those who use their creativity and power of development to consistently align themselves with customer interests and market developments will be able to succeed. This applies equally to the world’s No. 1 trade fair – MEDICA – as well as the COMPAMED trade fair for suppliers, which will be taking place at the same time. It is also a market leader in its market segment. With the aim of meeting the needs of the international professional public even into the future, the programme for the accompanying conferences and the forums integrated into the trade fair have, over recent years, been radically restructured and aligned at a more international level with many highlights also being presented in English and rounded off by ever-new formats that focus on topical subjects. The dynamic that characterises eHealth applications and the digital networking of those involved in the health sector are producing interesting business options, for example, particularly for creative start-ups – be it in innovative services, smart products or software applications. That is why the new MEDICA START-UP PARK has been created in Hall 15 with the intention of matching founders of innovative businesses up with potential business partners, investors and distribution partners. With the aim of complementing the contents that are going to be presented at MEDICA CONNECTED HEALTHCARE FORUM and the MEDICA HEALTH IT FORUM (both also in Hall 15), up to 40 start-ups will be presenting themselves and their ideas to an audience of experts on a total area of 500 square metres in direct proximity to these events. The MEDICA LABMED FORUM is also new this year. Under the key heading of “The Interdisciplinary Fascination”, laboratory medicine, molecular pathology, microbiology, medical technology and life sciences will be presenting themselves as drivers of innovation and generating new impulses for the entire medical sector. Four themed days will be offering a range of exciting presentations and panel discussions that will be focusing on the following highlights: Preventive screening tests for cancer, cardiac and circulatory conditions, innovative diabetes diagnostic tools, infection and migration. The events will all be taking place between 11.00 a.m. and 4.00 p.m. and are free for trade fair visitors with MEDICA tickets. The cooperation partner for the content for the MEDICA LABMED FORUM in Hall 18 is the medical publisher Trillium. Hall 18 is a modern structure that has been built with lightweight materials and that is located centrally between Halls 10 and 16. This temporary structure was specifically constructed for exhibitors who are presenting products within the MEDICA’s laboratory-technology and diagnostics sections, which were previously located in Halls 1 and 2. Background information: The South Entrance to the Messe Düsseldorf trade fair centre is being completely renovated, due for completion in summer 2019. The old Halls 1 and 2 are at the same time going to be replaced with a newly built hall. The new Hall 1, measuring 158 metres in length and 77 metres in width, with over 12,000 square metres of floor space, will be around the same size as Halls 8a and 8b once it is completed. One highlight at the conference programme – the MEDICA ACADEMY – will be celebrating its launch at this year’s MEDICA. It will be the venue for two workshops that are going to be devoted to ‘blockbuster’ subjects related to medical practice and that are going to be held on each of the four days of the fair. These will include, for example, ‘updates’ about imaging procedures, modern surgery procedures and even an ultrasound ‘refresher’ course. The MEDICA ACADEMY will also be discussing the ‘hand over of practices’ as a highly topical subject in a seminar aimed at both young physicians looking for practices and physicians wishing to pass on their practices. In addition to the MEDICA ACADEMY, additional items on the MEDICA’s conference programme will bridge the gap to the new products being presented at the trade fair through presentations with relevance to highly topical subjects and by focusing on the interests of the MEDICA’s important target groups. The 40th German Hospital Conference deserves mention here as a leading event for the management of German hospitals. The bandwidth in this regard ranges from political health questions through aspects of financing and controlling for hospital services to the presentation of best-practice projects for hospital IT. These will additionally be presented at the same time by the ENTSCHEIDERFABRIK IT (IT DECISION-MAKERS) initiative at a large joint stand in Hall 15. This year, the German Hospital Conference is to be complemented by the European Hospital Conference, which takes place every two years as a gathering that allows top decision-makers from European hospitals to swap notes. Other highlights include the DiMiMED conference for disaster and military medicine and the MEDICA MEDICINE + SPORTS CONFERENCE (respectively on 14 + 15 November 2017 / Congress Center Düsseldorf South) that will be focusing on prevention and sports medical treatment concepts. The conferences will be held in English and are geared towards an international audience. Its great reception from participants has meant that the MEDICA PHYSIO CONFERENCE, which was launched in 2014 and organised by the Thieme publishing house, has established itself firmly within the conference programme. With its treatment-oriented presentations, it is directed towards professional physiotherapists, sports medicine specialists and orthopaedists and is taking place this year on 15 + 16 November (Congress Center Düsseldorf South). Now, and in the future, a central strength of the MEDICA continues to be that it does not just deal with solutions for one individual medical specialist discipline, but that it offers solutions for the complete workflow of patient treatment in one place at one time. The more than 5,000 exhibitors from a good 70 countries will use MEDICA 2017 to present their entire range of new products, services and processes for inpatient and outpatient care. No other event worldwide comes even close to this wealth of innovations. Being clearly structured by halls, the MEDICA trade fair will be focusing on the following subjects: Electromedicine / medical technology (approx. 2,500 exhibitors), laboratory technology / diagnostics, physiotherapy / orthopaedic technology, commodities and consumables, information and communication technology, medical furniture and specialist furnishings for hospitals and practices. COMPAMED 2017 will be taking place in Halls 8a and 8b alongside the MEDICA trade fair on all four days (13 to 16 November). With more than 750 exhibitors, it is the driving force and internationally leading market platform for suppliers to the medical technology industry. The high levels of creativity and development know-how that characterises the supplier sector means that, over its 25 years of its existence, COMPAMED has become the place to see what the future of medical progress looks like. Be it product development, production and marketing or the desire for comprehensive solutions: COMPAMED constitutes the starting point for close collaborations between suppliers and their customers. This is something that may be demonstrated by the example of diagnostic applications for so-called ‘Point-of-Care Testing’. These are analytical procedures for patient-proximate and rapid while favourably priced and uncomplicated laboratory diagnostics. The equipment used in diagnostics and treatment must operate reliably and automatically for the benefits to be properly utilised. Samples must be directed towards analysis in precisely defined quantities and then processed and tested. Drugs must be adapted and dosed according to the individual disease patterns presented by the patients. And it is here that microfluidic systems play an important role. The development of smallest components and parts to this end has turned out to be highly complex but does provide the necessary basis for great progress in the field of ‘lab-on-a-chip’ technology, for example. So if an increasing number of illnesses which, just a few years ago, could only be diagnosed with the aid of complex laboratory analyses and that now can be detected with the help of cheque-card-sized mini laboratories, it is the exhibitors at the COMPAMED trade fair and their competence who are driving these developments. Other innovations that also deserve mention here are those that are being employed in so-called ‘wearables’ that are used to monitor important vital parameters and the functioning of implants. Be it suitable wireless modules for sharing data, the most delicate of sensors, body-compatible materials and coatings or powerful energy supplies that are associated with the smallest of footprints – the latest solutions are going to be presented at the COMPAMED trade fair with the most important aspects also being discussed at the two integrated specialist forums. This globally unique combination means that both MEDICA and COMPAMED will be reflecting the entire process chain and presenting a comprehensive range of medical products, devices and instruments. Together, they occupy the entire space at Düsseldorf’s exhibition centre. Of the 127,800 specialist visitors who attended MEDICA + COMPAMED in 2016, a good 17,000 were particularly interested in the topics covered within the COMPAMED event. As in previous years, it will be possible to visit both events with a single ticket. Date: 13 – 16 November 2017, Monday to Thursday.